Nurture the artistic side of kids and expose them to the decorative arts with this easy-to-understand series. 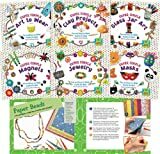 Each book uses super simple language and how-to photos to introduce early crafters to a variety of projects. Even seasoned crafters will be surprised by the ingenuity and functionality of these craft ideas! Super SandCastle is an imprint of ABDO Publishing Company.